The Gradišče hill, or Cukovec, lies to the north-west of the village of Margečan and south of the village of Gačice, while in administrative terms it belongs to the Ivanec Municipality. The remains of a fortification are still visible on the hill. 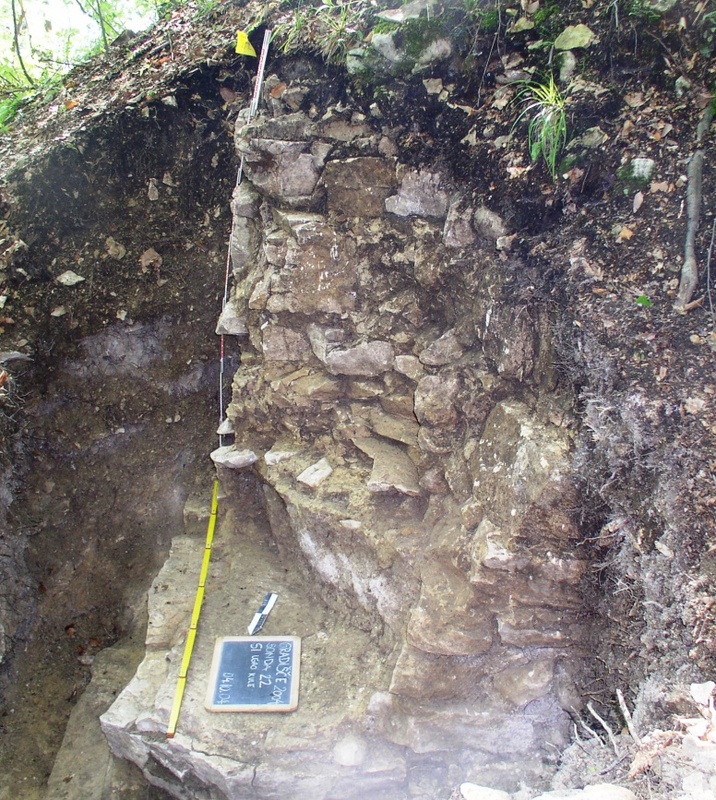 On the eastern, lower part, there are remains of a rectangular tower that controlled the access. 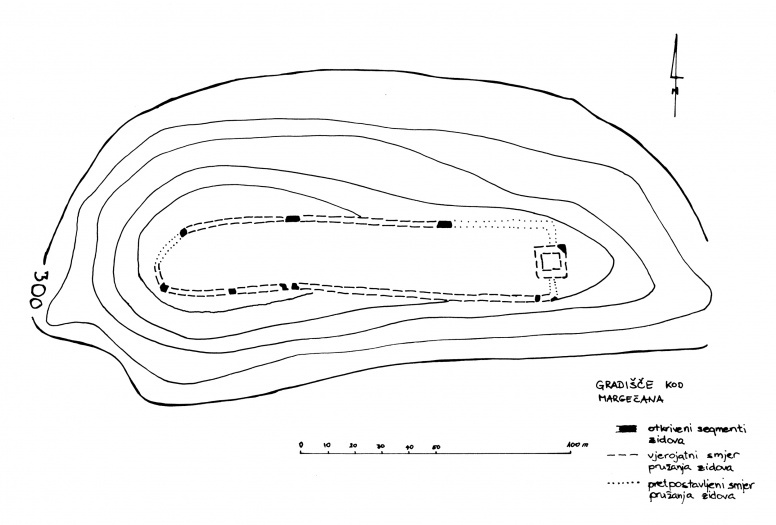 The tower measured around 11 x 11 m (outer perimeter), while the remains of defence walls extend from it westwards in the form of a very elongated ellipse of huge dimensions: it is 152.70 m long by around 28 m wide on the average. The relative height of the site with respect to the grassland adjacent to the Bednja river is around 120 m. The fortification is not mentioned in historical documents, and we do not even know its mediaeval name. 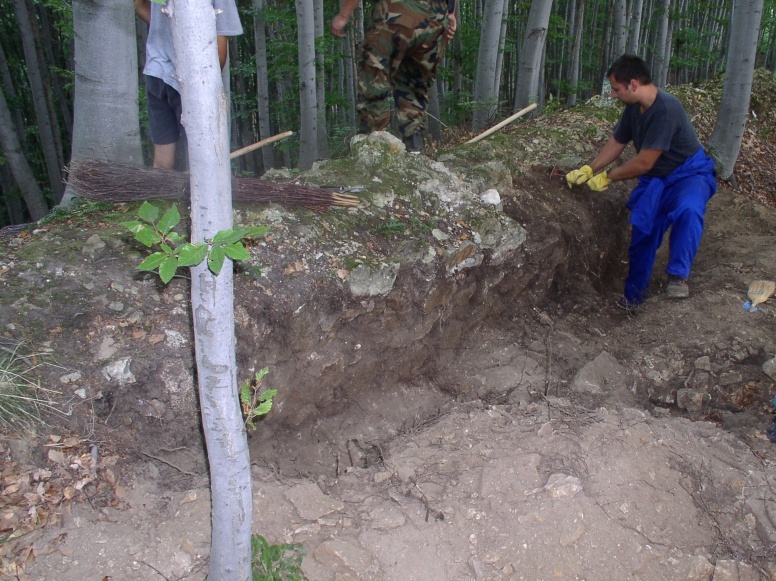 The Institute of Archaeology carried out test sondage excavations of the fortification in 2004, in collaboration with the student project of the students of archaeology of the Faculty of Humanities and Social Sciences of the University of Zagreb, Kristina Grubišić and Andrea Kudelić, titled Survey and documenting of the Gradišče site at Cukovec. The investigations lasted 10 working days and yielded a wealth of useful information regarding the method of construction of the fort. It also resulted in the creation of the first precise layout of the fortification. The collected archaeological assemblage was interesting, although the collected mediaeval pottery was conspicuously meagre and fragmented, which is not a rare case on similar mediaeval sites. Therefore, we still cannot answer the basic question about when and by whom the fortification was built based on the movable finds only. We can say without any doubt that Gradišče had been recognized as a convenient position long before the Middle Ages, considering that an elevated settlement, whose traces we encountered in our research, existed there already during the older phase of the Urnfield culture (13th-10th century BC). We have tried to find an answer to our questions by looking at the function of this building. 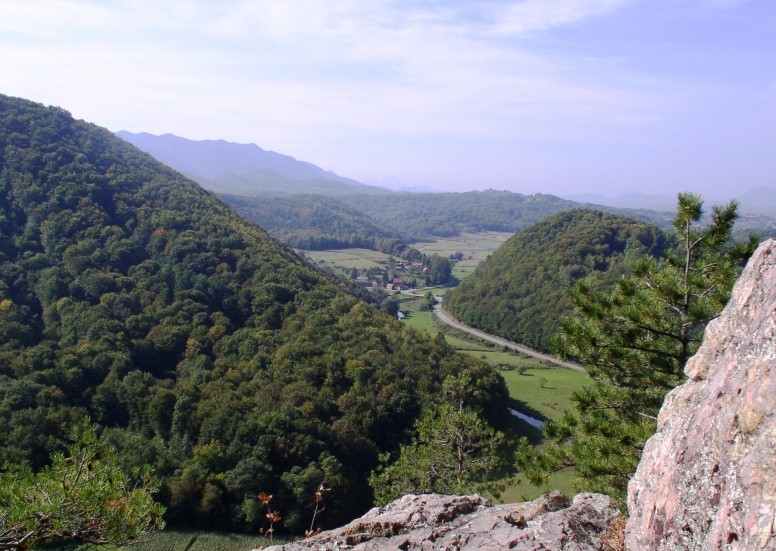 Based on its accessibility, we can date Gradišče to the period following the Mongol incursion. A similar tale is told by its imposing size and its two-metre wide walls. 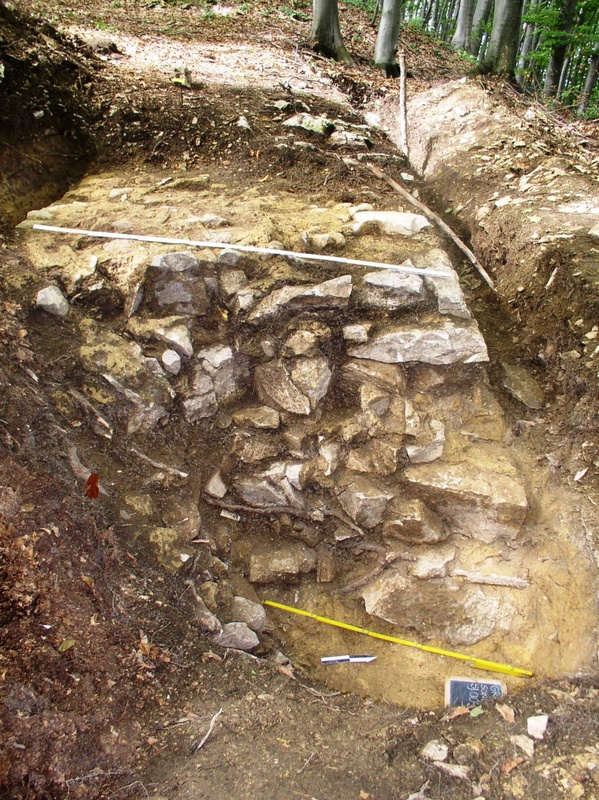 The muteness of historical documents, which would be all the more unusual in that case, might become more comprehensible if we hypothesize that this was a fortified structure that belonged to a chivalric order. There is in fact an older tradition that associates Gradišče with a knightly order (albeit the Knights Templar, documented by Kukuljević-Sakcinski in the mid-19th century). Gradišče is situated in the midst of the Bela Preceptory of the Knights Hospitaller, near the seat of the Hospitallers in Bela. Can we justify such a close existence of two fortifications? If we juxtapose Gradišče with Bela, we can easily observe great differences between the two: Bela is a residential fortified town of stone that controls the north-south communication, occupies the periphery of the estate, is rather small and situated high on a steep hill on an inaccessible position. On the other hand, Gradišče lacks traces of stone structures inside the ramparts, it controls the east-west communication, lies near the centre of the estate, is very large and situated at a low relative height, thus being easily accessible to freight vehicles. Differences of this magnitude indeed point to different and complementary functions of these two fortifications. While Bela may have been a safe and comfortable seat of the preceptor or castellan with necessary premises for storing equipment and food for the needs of the fortified town itself, the fortification at Gradišče may have functioned like a manor that stored the contributions of the subjects from the entire territory of the preceptory. Moreover, in the case of need, it may have served as a safe refuge for the surrounding population. We therefore have elements that point to the distinction residential fortification ÷ fortified economic centre. This, however, still does not mean that the two structures were created at the same time. It will be possible to say more only once the basic archaeological research has been carried out. Belaj, J. 2005, Utvrda Gradišče kod Margečana – rezultati pokusnih arheoloških istraživanja. Annales Instituti Archaeologici, I, 56-60.